Just 110 kilometers from Cancun is an idyllic place where salt water from the blue Caribbean Sea meets the fresh water of the creek, creating a fantastic natural phenomenon, the thermocline. It is here, in Xel-Ha "where water is born" where contact with mother nature is sublime and fun at the same time. Xel-Ha is well known for its snorkeling, you will find many fish and some beautiful stingrays that have made this their home. In addition, throughout this cove you will find several activities such as swimming with intertubes, a spectacular tour of the mangroves and the beauty of the entire place. The "trepachanga" two large ropes hanging over the sea, one for your hands and one for your feet that you use to cross the body of water and the "salpichanga" (ziplines into water) will test your balance and bravery. 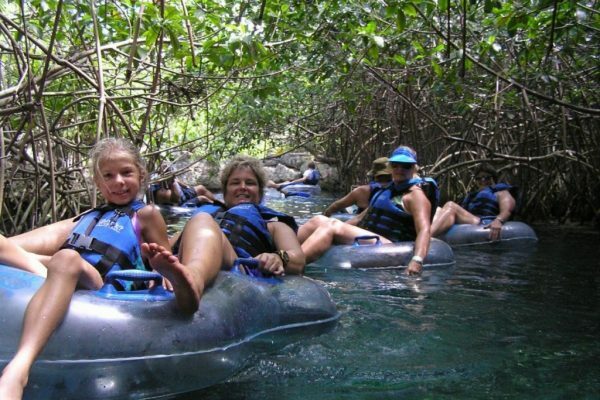 Best of all, Xel-Ha has activities for every member of the family. You will find a playground, rest areas with hammocks to relax, and even a tour of the jungle. If you prefer, you can ride a bike or fly your kite facing the sea. As you can see, Xel-Ha fun has no limits. This charming place is cared for by the owners to ensure, for many years, present and future generations can enjoy its natural beauty. Being faithful to the commitment to protect the environment, Xel-Ha has received numerous awards for being a sustainable park, including reforestation of native plants, pink snail conservation and integrated management of solid resource among others. You simply can not pass up the opportunity to live this experience. Make your reservation here.